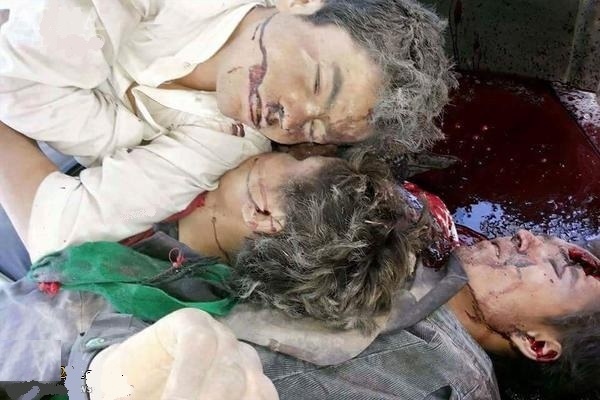 JNN 07 Aug 2015 MAZAR-I-SHARIF: Wahabi Terrorists on Saturday shot dead 13 Shia Hazaras after dragging them out of their vehicles in northern Afghanistan . All victims belonged to the largely Shi’ite Hazara ethnic minority that was persecuted by the hardline Wahabi Taliban during their rule in 1996-2001, said Jafar Haidari, district governor of Zari in Balkh province. The attack began when masked terrorists stopped two small sedans in Zari district and proceeded to drag male passengers out of the cars and shoot them, said Abdul Razaq Qaderi, the deputy police chief of Balkh. “They spared one woman who was in one of the vehicles,” he added, noting that officials were trying to determine who was responsible for the attack. Taliban activities have been observed in the area in the past, but the group released a statement denying any involvement in the attack. Hazaras make up the third largest ethnicity in Afghanistan. As Shiites, they are also a religious minority in Sunni-majority Afghanistan. Last month gunmen kidnapped 12 Hazaras from a Van in east Afghanistan, days after suspected Taliban fighters kidnapped and killed four Hazaras in the same province. Nobody immediately claimed responsibility for Saturday’s attack. Munir Ahmad Farhad, a spokesman for the Balkh governor, said an investigation team had been sent to the area. Almost 5,000 civilians died in fighting and attacks in Afghanistan in the first half of 2015, the United Nations says, attributing around 70 percent of the killings to the Taliban. The Islamist militants were ousted from power by a U.S.-led coalition in 2001 and are waging an insurgency against the foreign-backed government. This entry was posted in Asia Pacific and tagged afghanistan, Genghis Khan, hazara, Shia Hazara, Terroriists. Bookmark the permalink.